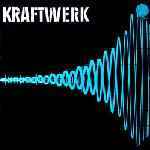 Compilation of Kraftwerk's first two albums. Identical bootleg reissue of Kraftwerk, with same cat. numers. Comes in a single sleeve instead of a gatefold one. Track list is printed on the back sleeve. B2 is misspelled as "Vim Himmel Hoch".